How to Calculate Garment SAM? Standard Allowed Minute (SAM) is used to measure task or work content of a garment. So you need to calculate the garment SAM to establish the standard time of the individual garment operations as well as the whole garment SAM. This 'SAM' term is widely used by industrial engineers and garment production people in the garment manufacturing industry. In this article, you will learn how to calculate standard minute (SAM) of individual sewing operations. For the estimation of the cost of making a garment, SAM value plays a very important role. In past scientists and apparel technicians did research on how much time to be allowed to do a job when one follows the standard method of doing the job. According to the research study, minute value has been defined for each movement needed to accomplish a job. Synthetic data is available for each movement. General Sewing Data (GSD) has defined a set of codes for motion data for SAM calculation. There are also other methods through which one can calculate SAM of a garment without using synthetic data or GSD. Both the methods are explained in the following. In this method 'Predetermined Time Standard' (PTS) code are used to establish 'Standard Time' of a garment or other sewing products. Step 1: Select one operation for which you want to calculate SAM. Step 2: Study the motions of that operation. Stand by the side of an operator (experienced one) and see the operator how he is doing it. Step 3: List down all motion sequentially. Refer the synthetic data for TMU (Time measuring unit) values. For synthetic data, you can refer GSD (without license use of GSD code prohibited but for personal use and study one can refer GSD code and TMU values) or Sewing Performance Data table (SPD). Now you got TMU value for one operation (for example say it is 400 TMU). Convert total TMU into minutes (1 TMU=0.0006 minute). This is called as Basic Time in minutes. In this example, it is 0.24 minutes. Step 4: Calculate SAM by adding bundle allowance and personal allowance to the basic time. Standard allowed minutes (SAM) = (Basic minute + Bundle allowances + machine and personal allowances). Add bundle allowances (10%) and machine and personal allowances (20%) to basic time. Now you got Standard Minute value (SMV) or SAM. SAM= (0.24+0.024+0.048) = 0.31 minutes. I like to refer you an article Secret Behind Calculation of Machine Time in SAM for better understanding of SAM calculation. Step 2: Take one stopwatch. Stand by the side of the operator. Capture cycle time for that operation. (cycle time – total time is taken to do all works needed to complete one operation, i.e. time from pick up part of the first piece to next pick up of the next piece). Conduct time study for consecutive five cycles. Discard data if you found abnormal time in any cycle. Calculate the average time of the 5 cycles. the time you got from time study is called cycle time. To convert this cycle time into the basic time you have to multiply cycle time with operator performance rating. Add bundle allowances (10%) and machine and personal allowances (20%) to basic time. Now you got Standard Minute value (SMV) or SAM. SAM= (0.48+0.048+0.096) = 0.624 minutes. Online Clothing Study: How to Calculate Garment SAM? Garment SAM and SMV calculation procedure is explained with example. 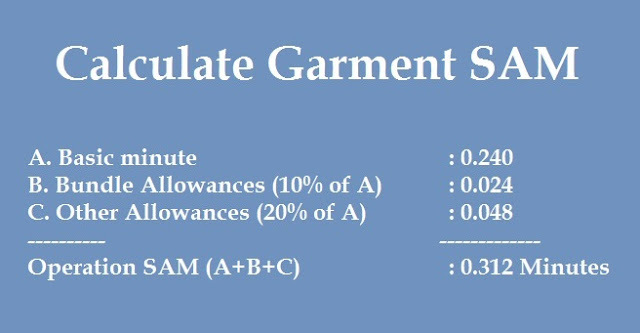 Two methods are shown to estimate the garment SAM.